My progress wasn’t as fast as expected for the two mug rugs as I’ve been ill since last week and was suffering from back pain, which doesn’t allow me to sew for long periods. Having to cope with tutoring the kids for their mid-year exams didn’t help too. I’m however working on the hand appliques for the Flower Basket Mug Rug top now, as I’ve completed the Growing Flowers Mug Rug top last week. What’s left is actually to quilt and bind the mug rug. I’ve unfortunately missed the deadline to mail the mug rugs which is today! I’ve just emailed my swap partner to explain the situation and hope she understands. Working on it really hard now, so I can mail it out by next week. 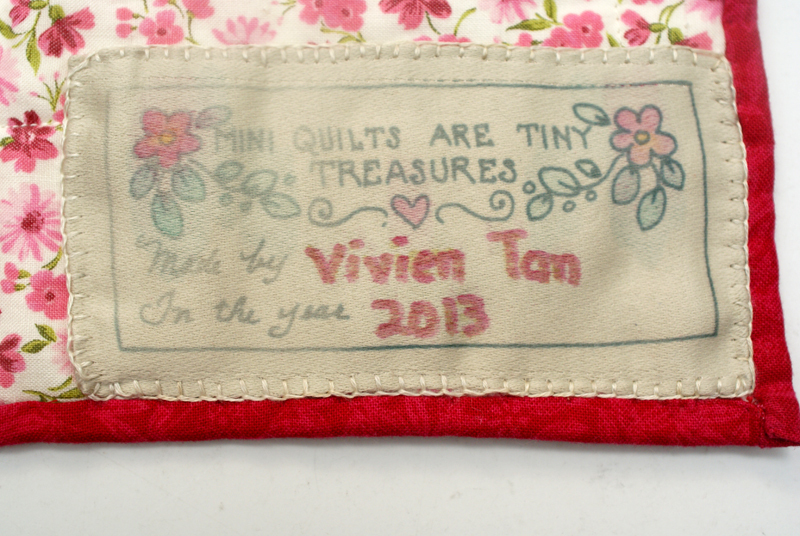 Michele from the Quilting Gallery has organised another exciting mug rug swap and I’m in! This time, the theme is “Springtime Flowers” and the designs are so pretty! 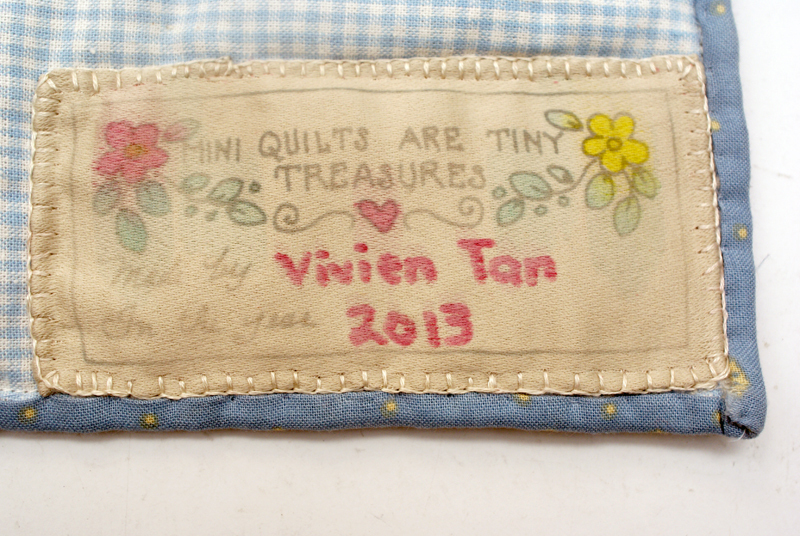 My partner is Pam from USA and I’m happy to be sewing for her. Her favourite colour is purple and I’m trying my best to have different shades of purple on the mug rug. Thank god purple is also one of my favourite spring colours and I’ve lots of purple stash lying around. I finally found time to start on the mug rugs this week and I’m halfway done with the first mug rug. The applique pieces have been ironed on and I hope to finish my hand applique for the top this weekend. Over the past two weeks, I’ve been imparting my sewing and quilting skills to Edith, who has lots of time on her hands after the school exams. I thought a mug rug would be something interesting and easy to start with and she jumped at this idea. She chose the mistletoe mug rug design which I purchased from Etsy recently. 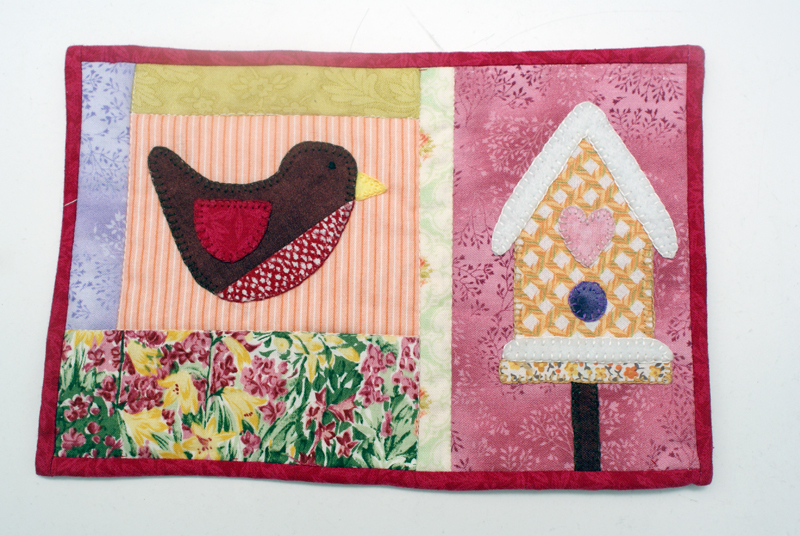 There’s reasonable piecing involved and appliqued design didn’t seem too tedious for a beginner. The sewing lessons were seamless and much easier than I imagined! She didn’t gawk or withdraw in fear at the machine, but picked things up pretty quickly! This is what she had completed last Sunday afternoon. She’s working on the mistletoe appliques right now, and very soon, we’ll be working on the quilting and binding, which I hope will not prove to be too challenging! This is such a nice item to make for Christmas, don’t you agree? Yeah….after a few weeks of working on my mug rugs, they are finally completed and will be on their way to my swap partner tomorrow! My partner is a lady from Australia and I do hope she likes them. I’ve been too bogged down with work and kids lately, had it not been Gary lending his hands to do the finishing touches (ie binding), I may not be able to make it for the deadline! Thank you darling! I should give myself a pat on the back, this being my first try in doing appliques, and I think they didn’t look too bad! 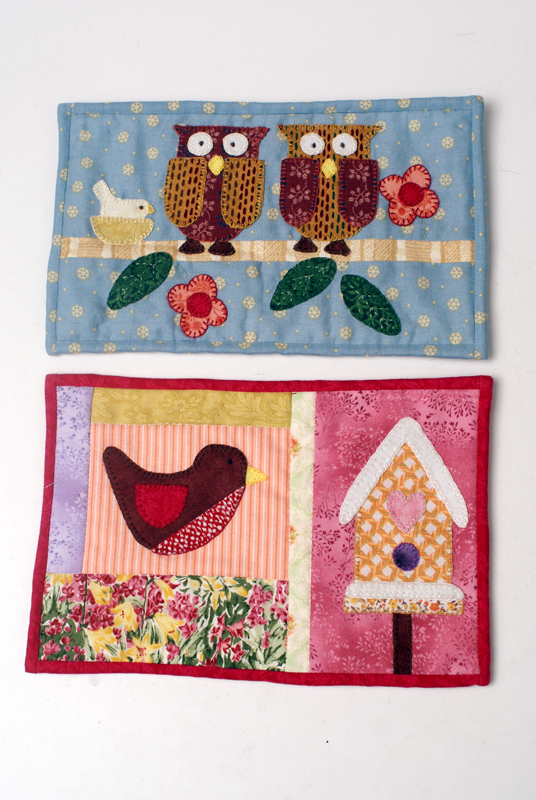 I do hope to try out machine applique sometime soon….if I could find the time to practice. 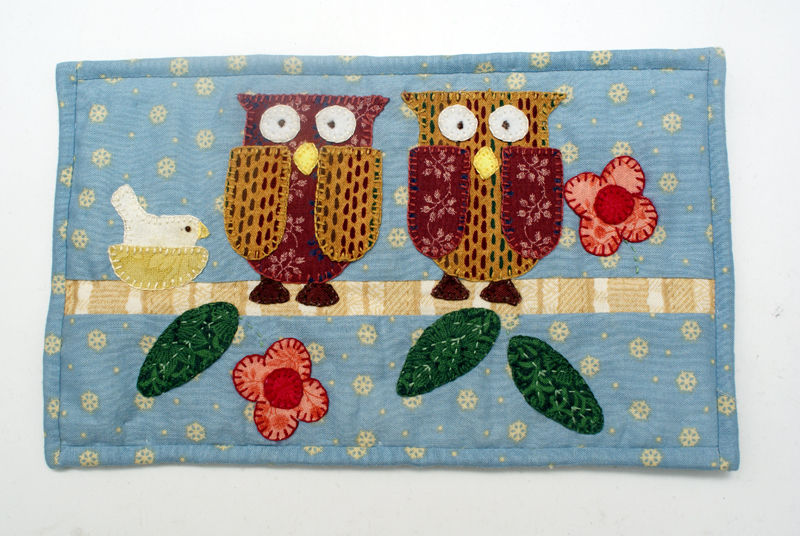 I’ve not received my mug rugs but I do hope I get them soon….it’s so exciting!